This was hard. Not because silly is a hard thing to capture with kids, but because at the end of the day, I had so many pictures to go through. But, I decided to limit myself to just one. One photo that could stand alone to reflect that word, without explanation. Then I noticed what was actually “uncorrect”… he had Gus’s pants on, as really tight, unzippable shorts. 12m pants, on my child who wears size 6 pants. Eeep. 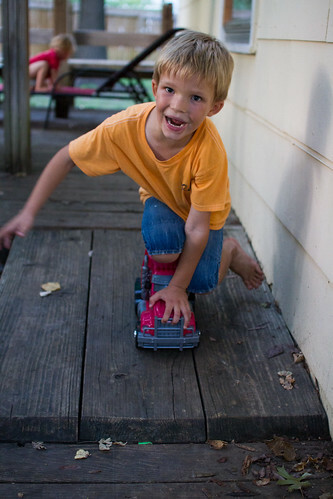 “Skateboarding” on a toy truck, while wearing his little brother’s pants as shorts. P.S. If you are joining us on Instagram, use #capturingoctober and if you are joining us on your blog, post the URL in the comments. Very cute. No front teeth! He’s going to look SO different when they grow in.